All TROON VERDE homes currently listed for sale in Scottsdale as of 04/24/2019 are shown below. You can change the search criteria at any time by pressing the 'Change Search' button below. 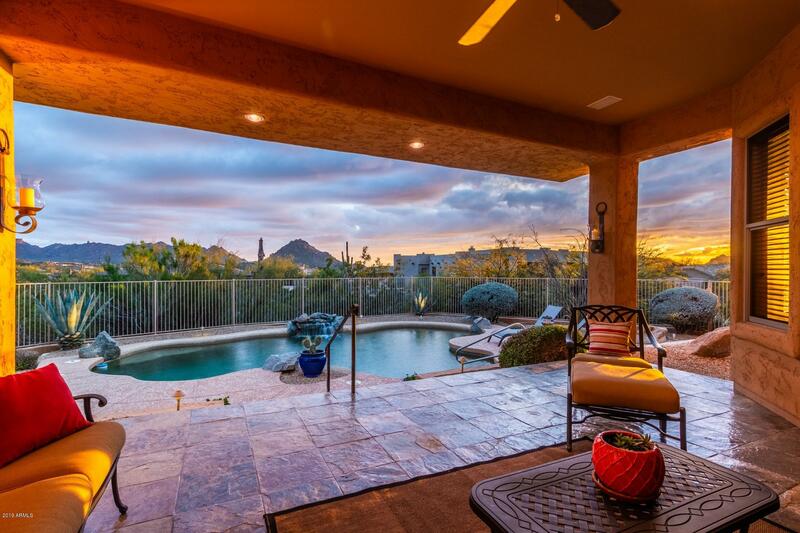 "ENJOY THE AMAZING MOUNTAIN VIEWS FROM YOUR LIVING ROOM, BACK PATIO, MASTER SUITE AND EAT-IN KITCHEN. THIS LOVELY WELL-MAINTAINED HOME IS MOVE-IN READY FOR NEW OWNERS. SITUATED ON THE TOP OF A HUGE CUL DE SAC LOT IN A VERY STABLE AND DESIRABLE GATED COMMUNITY. VERY OPEN FLOOR PLAN. LIVING ROOM COMPLETE WITH GAS FIREPLACE AND ASSORTED NICHES. OPEN TO DINING ROOM (CURRENTLY USED AS A MUSIC ROOM), AND OPEN TO KITCHEN AND EAT-IN DINING. LARGE KITCHEN ISLAND WITH GRANITE COUNTER-TOPS AND CUSTOM STAI"